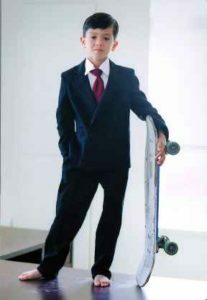 This kid is soon be the next lawyer in your legal practice – or the lawyer you hire to support your legal issues. Are you ready to deal with him? He’s wired, uber-connected, collaborative, fast, and is unlike any lawyer you have ever known! I’ve been remiss in blogging – 20+ keynotes since January, so I’ve been on the road. I’ve got lots to report on what I’ve been focused on in a huge range of different industries. Back at the start of this travel odyssey, I found myself in Palm Springs, California, as the opening speaker for the 2012 California Community Associations Institute annual conference. In the room were several hundred lawyers and legal professionals supporting condominium and other community developments. My focus? The key trends that would impact their role, both as lawyers and as individuals involved with complex real estate, construction and building design issues. So I did my homework, and put together what I thought was a great keynote. Certainly the instant Twitter feedback emphasized that I likely hit a home run. I addressed numerous issues — including what will happen to the legal profession when the next generation of kids — who have grown up never knowing a world without an iPhone — enter the legal profession. Everything changes…. And here’s the fun part of my job — its’ always fascinating to find, after the keynote, the impact that I might have made on some people in the room. Which leads me to a post I found at the blog for Goodman, Shapiro and Lombardi LLC, a firm specializing in this industry, but based in Massachusetts and Rhode Island. I’m often greeted by such a reaction. But that’s my job — I spend a huge amount of time thinking about future trends, undertaking research in dozens of industries, meet hundreds of executives at the events that I speak at and prepare for — and synthesize all of this into a concise 45 minute to 1 hour overview of what the folks in the room should be thinking about. In this case, my keynote focused on two big issues: the future of the legal profession, and the key trends that would impact the construction/condominium industry and communities going forward into the future. This is true — you can read about my keynote for NASA in this post, and a simple search for PGA on my Web site reveals all kinds of posts on my keynote for the “largest working sports organization in the world.” You don’t get to to do my type of job if you aren’t on your “A-Game” all the time! 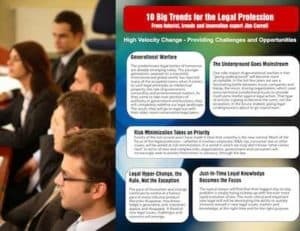 Part of my keynote in Palm Springs focused on my “10 Big Trends for the Legal Profession” – read the PDF by clicking on the image. It bears emphasizing that he was talking to a roomful of lawyers – people who, by definition, practice in a conservative profession averse to change or novelty. Indeed, much of the law is based on precedent and the notion that if it hasn’t been done before, it probably can’t be done now. Yet our challenge, at this particular moment in history, is to get ahead of the curve, to dare to be groundbreaking. This may seem threatening, but it’s a message that should resonate within our industry as we think about what this means in concrete terms. On the horizon, I see more green buildings; eco-design; solar panels; and electric cars, among other innovations. There will certainly be legal implications for all this, and we need to be ready. In short, we need to think creatively and to embrace change. And there’s my home run from the keynote – right there: “In short, we need to think creatively and to embrace change” and “Dare to be groundbreaking.” My job is to get people thinking about the future, and challenging them to think and act differently to deal with an ever faster rate of complex change. It’s always a thrill to look back to see that I’ve pulled it off!